Inner City Helping Homeless was formed in November 2013 to combat the ever growing homeless crisis that was clearly evident across the city of Dublin. They provide a frontline outreach service covering the city of Dublin. They currently operate a seven day outreach service across the city, coinciding with out mobile outreach unit. Their outreach teams are made up of volunteers who operate from 10pm -2am. Rough sleepers are offered the opportunity to access a bed if available from Central Placement Services or provided with a sleeping bag, some hot drinks, food and a chat from outreach volunteers. The opportunity arose for Our Lady of Mercy to support the work of the ICHH through the John Paul II Awards. Transition year students collected hats, scarves, gloves and other winter clothes to donate to the ICHH. 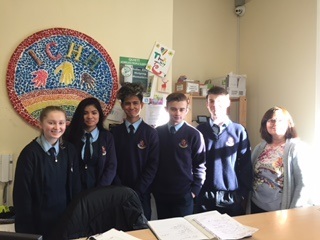 On behalf of TY students and all at OLM Óisin, Sorcha, Xavier, Celine and Jack made the trek to the ICHH offices on Amien Street where they were met with a very warm welcome from Ann who shared her experience and insight. Thank you Ann.